I loved Arnold Palmers before I knew that’s what they were called. Half Iced tea, half lemonade, all tasty. Tart, sweet, and refreshing, it’s perfect for a lazy late summer afternoon. When you add whiskey? Even better. You can make this drink according to your own level of taste/laziness/time availability. Make it all from scratch, buy the tea and lemonade pre-made, buy powered mixes for one or the other or both (though that might be a tad too sweet), or do a combination of any of the above. For this one, I decided on the scratch method all the way. I started with a batch of sun tea. Pour four cups of water into a pitcher, add twelve tea bags, and set the pitcher outside in the sun for a good hour. Remove the tea bags (squeeze the excess water out), add four more cups of water, and refrigerate. I didn’t make an entire pitcher of lemonade in deference to the lack of available space in my refrigerator, so I just made a small amount in my shaker before adding my tea. Pour 2 oz lemon juice in a shaker, followed by the same amount of cold water. Stir in 1 TB simple syrup (more if you like it sweet). Follow with 4 oz iced tea. 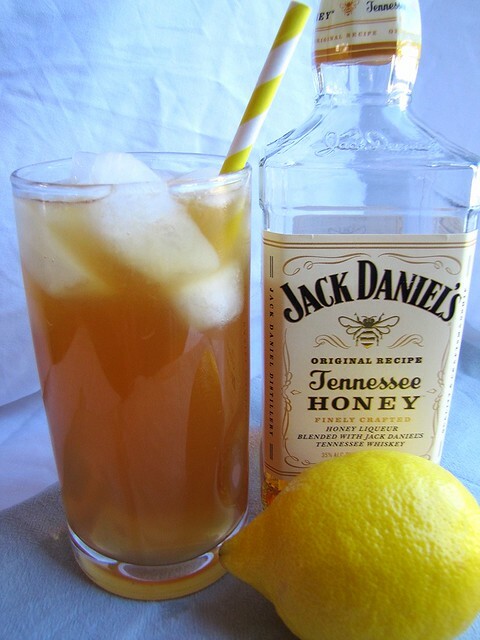 Add 1-2 oz Honey Whiskey (or any whiskey you prefer) and ice. Shake for a few seconds, pour and serve. Pour all ingredients into a shaker, add ice. Shake, pour, and serve. It’s obviously easier to just make one pitcher each of lemonade and iced tea and make each drink as needed. Or you could make an entire pitcher of these at once. Just be sure my invite doesn’t get lost in the mail.